Roof bedding and pointing are essential parts of a roof’s structure and require regular maintenance to ensure your house stays in top condition. Roof bedding is a cement mortar that holds the roof tiles in place. Over time, the bedding is subjected to natural wear. Loose tiles are a common sign that the roof needs to be re-bedded. If the bedding is not maintained, it may crack or fall away completely and leave the roof tiles unsecured. Unsecured roof tiles may easily become displaced or even slide off the roof, becoming dangerous for anyone near the house and leaving your house unprotected from the unforgiving Canberra weather. When your house is re-bedded, we apply a cement mortar then go over the top of that with a flexible pointing material to increase the mortar’s hold on the roof tiles and provide a durable protection layer over the mortar to increase the life of the bedding. Roof pointing is a second layer which goes over the top of the bedding to help create a stronger hold on the tiles and seal the roof against dust and water. Cement mortar used to be used for roof pointing but has been replaced by flexible pointing compounds. Flexible pointing expands and contracts with changing weather conditions, which is especially relevant in Canberra with its wide temperature range. If your pointing has cracked or deteriorated, your roof is far more likely to start to leak which will cause damage to your home. 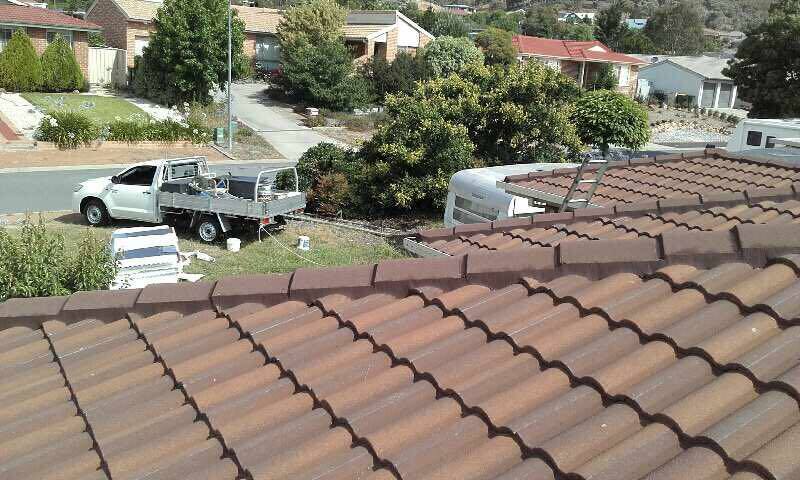 Flexible roof pointing has been used in Australia since 1995. If your house does not have flexible pointing, we strongly recommend your roof be re-pointed. Cement mortar pointing is far more likely to crack and allow water in your roof. It is widely recommended by roofing professionals that your house be repointed at least once every 10 years.